Sir Ronald retired from the Army in 2013 after 26 years, earning a bronze star and three Iraqi campaign stars as well as other numerous awards. 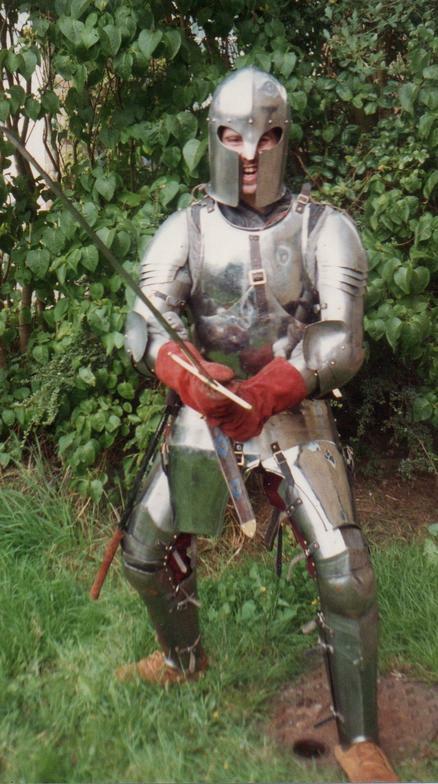 He began his historic European Combat training in Europe in 1989 under Andy Jarvis and Roger Lankford. He has trained in full armor and in the use of steel weapons. Performed reenactments at the actual battlefields and castles in England. Worked in films doing combat footage. Ronald has Black Belts in Ching Sai Do/Tae Kwon Do and combat Hapkido and was part-owner and head instructor at The Black Belt Academy. In 1995 Ronald was a team member in the Martial Arts World Cup both as a competitor and a Coach for the U.S. team. He returned to Oregon in 1996 to continue his training in medieval combat as well as Olympic style Tae Kwon Do. In 2012 was granted a knighthood into the Dynastic and Chivalric Order of Green Cross. In 2015, he was promoted to Knight Commander and made Priory Commander for the State of Oregon. Additionally, he has received a second Knighthood and promoted to Knight Commander in the Order of The True Cross. He is currently working on his new instructional book "European Conglomerate"; which details his unique and innovated medieval combat style. With over 28 years of training in steel combat, he has a unique and broad knowledge into the how's and why's of sword combat and is highly sought after for instruction and advice.